Let me begin by saying, I hate doing the dishes. Yet, a pile of dirty dishes in the sink drives me to distraction. It's a terribly vicious cycle of annoyance. So, when I first began baking on my own (in other words, doing more than waiting to lick the spoon), the main selling point of a recipe was how little washing up there was to do after. Words like one-bowl and melt & mix were a siren song to my dirty dish hating ears. These muffins were one of the first things I ever learnt to make and as such; I dub them Idiot-Proof Muffins! This recipe uses exactly one bowl, one jug and one spoon. Period. These muffins are soft and fluffy with that deliciously crusty top that all the best muffins have. I bake mine in patty cases because I love softer muffins but these can just as easily be baked directly in the muffin pans for a crusty all over texture. Don't be fooled by these innocent looking babies, they're definitely more cake than breakfast food! As you can see I made three types of muffin; (from left) raspberry, chocolate chip and orange poppyseed. Okay, so technically I used more than one bowl but I really couldn't pick which type I wanted to make! Decisions, decisions! I used dark chocolate chips here. The muffin mix is sweet enough that milk chocolate might just tip it over the edge! 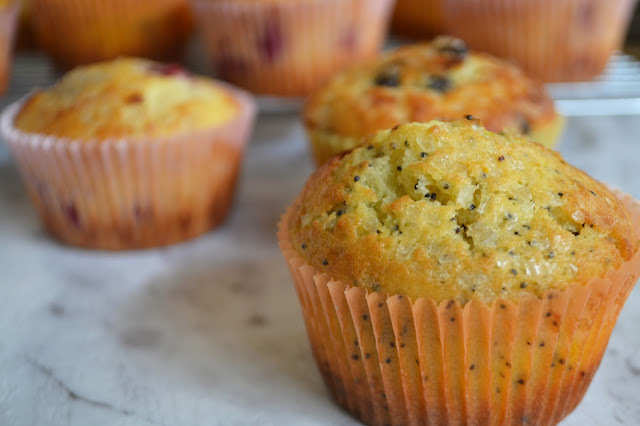 I love the crunchy pop of poppyseeds in this muffin. I used orange zest but you could also replace some of the buttermilk with orange juice for a more pronounced orange flavour. I top my muffins with Demerara sugar for extra crunch but you could also use oats or nuts. Before I stir in the raspberries (I used frozen berries) I dust them with about a tablespoon of flour to stop them from sinking to the bottom of the muffins. As you can see, this recipe is amazingly versatile and can be tailored to suit any taste. Keep reading after the jump for the recipe! I normally use regular milk to make these but I had some buttermilk knocking about the fridge so I used that. This recipe will work with either but I do find that the buttermilk makes them just that little bit fluffier. I've also made these with a half greek yoghurt/half milk mix that worked really well too. Optional extras: berries, citrus zest, chocolate chips, chopped apple, cinnamon, mashed bananas, poppyseeds, chopped nuts, peanut butter, chopped peaches, shredded coconut, cocoa powder...the sky's the limit with this! Just be mindful of the final texture of the muffin mix when you're using soft or wet fruit. It should be the consistency of whipped cream or greek yoghurt. First of all, you need to preheat your oven to 200 degrees Celsius. Line a muffin tin with patty cases. Take a bowl and combine the flour and sugar. In a jug, combine the milk, eggs and vanilla. Make a well in the centre of the flour mixture and pour in the egg mix. Give your jug a quick rinse and use it to melt your butter in the microwave. Don't nuke for too long as you don't want the butter to be too hot. Give the flour and egg mixtures a quick stir then add the melted butter. Using a large metal spoon, gently fold the ingredients together till they are just combined. Halfway through this, add your mix-ins and continue to fold till everything comes together. It's normal to have a lumpy mixture. Divide into patty cases and sprinkle with Demerara sugar. Bake for 15 - 20 min or until golden. Cool on a wire rack then enjoy! Muffins will keep in an airtight container for up to 4 - 5 days but are at their best the day they're baked. Baked muffins can also be frozen.